I’m so excited to finally be able share this pattern with you! It’s been a draft for way too long. So as you may know, my cousin (who happens to live in Canada) just had a bouncing baby boy! Of course, being the crocheter and all, I decided to make her a baby blanket. I pretty much make one for every friend/family member that announces their upcoming bundle of joy so I had to continue the tradition. I used the opportunity to test a pattern for a simple but elegant shell stitch baby blanket. I hope you enjoy the pattern! Approximately 1860 – 1862 yards (1701 – 1703 m) of Category 4 worsted weight yarn in 3 different colors (approximately 621 yds of each color). With Color A, Ch 133. Row 1: 2 dc in 4th ch from hook, *sk 2 sts, 1 sc in the next st, sk 2 sts, 5 dc in next st** Repeat from * to ** until there are 3 sts remaining, sk 2 sts, sc in last st, turn. (Now you have an option to change colors or do what I did and crochet 3 rows with Color A before switching to Color B). Row 2: Ch 3, 2 dc in the first st (sc from previous row), *sk 2 sts, sc in next st, sk 2 sts, 5 dc into the next st (sc from previous row)** Repeat from * to ** across, sc in the t-ch, turn. Row 3-69: Repeat row 2, alternating colors every 3 rows if desired. To even out the top row of shells: 1 dc into the first st (the sc from previous row), *hdc in the first dc of the 5 dc cluster, sc into each of the next 3 dc, hdc into the last dc of the cluster, dc into the sc** Repeat across. This should make the top row straighten out. Fasten off and proceed to trim instructions. 4 hdc in first st, *sk next st, sc in next st, sk next st, 4 hdc in next st** Repeat from * to ** around entire blanket, sl st into the beginning ch 2. Finished blanket measures approximately 35″ x 35″ including edging. Love your pattern. Thank you for sharing. I would like to make a bigger blanket. What is the multiples? Looking forward to hearing from you. I am having some trouble with the edging/border on the the bottom/foundation row of the blanket. It is way too loose and has made the blanket look longer on the bottom. Any tips? The blanket was perfectly symmetrical and even before I added the edging and now it doesn’t look right. My son will be born within the week and I’m trying to have it finished before then! Hi Shanna! Sorry for the late reply. You can leave the edging off if you find it is not working out and just simply add a sc border around. Thank you for this lovely design! Your photo tutorial made it so clear for me as a complete beginner. I really enjoyed making my first ever crochet project, and can’t wait to give it to my sister-in-law. First little niece or nephew due in May! I love this pattern! The border you put on it looks fantastic :-). Thank you so much for sharing! Such a lovely pattern! Yarn combination is excellent. Thank you for answering, it was very helpful. Hi, I’m using light weight yarn #3 for this pattern. What size needle would I use? I am a beginner in crocheting. I’ve only been doing this for a few years. Thank you so much. Hi Debbie! I would use whatever hook the yarn label calls for. Please note that the blanket size will not be the same as the pattern since the lighter yarn will make it smaller. I wanted to make the gauge first. I don’t normally. I crocheted 16 sc for 10 rows and I didn’t come close to a 4 inch square. I don’t think a bigger hook would make up the drastic difference. Is 16 sc for 10 rows correct for a 4 inch square gauge? Hi Tiffany! The gauge is worked in the pattern stitch, not sc. If you work the swatch according to the pattern then you will see the gauge is different. You can also try working a swatch in dc. It will be closer to the correct gauge. My husband and I lost a baby to miscarriage about six weeks ago, and I just finished this blanket in rainbow stripes. Hopefully soon I’ll be able to snuggle a rainbow baby in it! I’m so sorry Andrea. I hope that you can snuggle a beautiful rainbow baby too! I love this pattern! I used two strands at once to make it a little more cushiony, and LOVE the result. I made this in buttercup yellow with a mid and light grey for our first grandchild. It looks fantastic and the parents, who love grey, agree. Thanks so much for sharing the pattern. I have LOVED working with this stitch! It just so happens that I found that it works up beautifully using Caron’s Simply Soft yarn. There’s a slight sheen to it that’s so attractive, plus it’s still soft for a baby blanket. I couldn’t help but blog about it! Check out the colors I chose and how I found this pattern on my blog! Hi Jennifer! You will be skipping the last 2 dc and putting your sc into the ch-3 of the previous row. Is there a way you can do a photo tutorial about the edging and shells? Also is there a specific number of edging stitches we need for the shells or does it not matter? Hi Jennifer! I will try to work on a photo tutorial either this week or next week. I will get back to you soon. I made this blanket for my new great-nephew. It turned out perfect! It is puffy and therefore very cushioning. Great for laying the baby on the floor to play with him. I love that it doesn’t have all the holes that snag little toes and fingers. Thank you so much for this absolutely simple, yet gorgeous pattern. I’m so glad that you enjoyed the pattern! It is a great baby blanket which is why I love it so much. I was needing a new project to start and this just happened across my Pinterest feed. Turns out I love it so much I had to blog about it! I’m using Caron’s Simply Soft and really enjoying the combination of the shape of the stitches and the slight sheen of the yarn. This is my WIP so far! Thank you so much for this pattern. I made it for a friend’s baby shower. I wish I could share a photo with you. Hi Adrienna, unfortunately Lion Brand has discontinued several colors of this yarn, including the white that I used for this blanket. A great alternative would be Lion Brand Vanna’s Choice or Hobby Lobby I Love this Cotton or I Love this yarn. I am not sure if you will find the exact colors but there are a great selection of colors for the brands that I mentioned. Hi Adrienna, I would suggest the Hobby Lobby I Love this Cotton or Lion Brand’s new cotton yarn called 24/7. Hi Felicia! The hook size is listed in the materials. I haven’t tried an intermediate pattern yet, but this is going to be my first, after I finish my current project. This is beautiful. When you even out the top row with the instructions you gave, you do that before you fasten off and start the trim correct? Also, what colors did you do the trim and then the shell edging in? My blanket is white, yellow, and gray and I’m not sure what would look best. Thank you so much! I’m really loving this pattern and the way it’s turning out! Here’s hoping I can finish it before the baby shower on Sunday…. It’ll be close. You can do it Laurel! Please let me know if you have any other questions! I have a quick question about this. The bottom (foundation row) of my blanket is straight, while the finished edge is a scallop. Is there a way to even it off into a perfect edge before creating the scalloped edging or did I mess up because one side is straight? Hi Rae! To even out the top row of shells: Sc in the first 2 dcs of the 5 dc cluster. Sl st into each of the next 2 dcs, sc into the last dc of the cluster and into the sc from previous row. Repeat across. This should make the top row straighten out. Hope that helps! Thank you. Now I got it!!! You’re welcome! I am glad you go it 🙂 Let me know if you have any other questions! If I wanted to make the blanket 50 x 50, how many chains would I need to start with? Thank you. Hi Michaela! Thank you so much for your kind words 🙂 So glad you enjoyed the pattern! I am really happy with your pattern. It is working up beautifully and is virtually reversible. I am making it for our first great grandchild, in a sea-foam green. I have made this blanket several times for friends and just love it. Thank you so much for your beautiful creativity! It is so fun to make! Thank you so much Brenda! I am so happy that you like my pattern! I love hearing from people that make things using my patterns 🙂 Best Wishes! COULD SOMEONE PLEASE EXPLAIN TO ME HOW TO DO A HDC STITCH?? 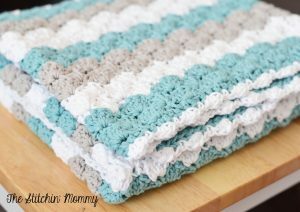 OR IS THERE ANY WAY THAT I COULD SEE STEP BY STEP ON A VIDEO HOW TO MAKE THIS SHELL BABY BLANKET. IT’S JUST EASIER FOR ME TO SEE AND DO THAN READ AND DO. I WOULD GREATLY APPRECIATE ANY HELP IN MAKING THIS. WOULD LOVE TO LEARN HOW. EVERYTHING I MAKE IS WITH DCS OR SC. THANK YOU SO MUCH FOR YOUR TIME AND HELP. Hi Suzette, I do not have a video tutorial but I do have a step by step photo tutorial of how to make the shell which you can find here. I also have a photo tutorial for the hdc stitch here. If you are looking for video tutorials, you can check Youtube. Can you make this bigger? Hi Cheryl, I have provided the stitch pattern multiple in the pattern so that you can make a larger blanket/afghan. I love the blanket but would like to do it smaller for a pram or car seat. Is there a pattern repeat number of stitches for each row please? Thank you so much for sharing this beautiful pattern! I love the colors you used. I’m on the second row of the pattern now, which I enlarged to make an afghan for a friend. It works up so easily and is so pretty! As another commenter stated, it’s just what I was looking for! Hello! This pattern was just what I was looking for! Thank you! This pattern is wonderful. I am making it in a larger size for my daughter. So easy to do and fast. I always seem to mess up my counts on the ripple blankets but this one is so easy. Thank you. I really like this, but it will be challenging for me, as I have not done shell stitches before. The look is just right! Hi Amy, I nearing the end of this blanket and I have a question. After completing the last row of the shell pattern, how do I create a straight edge on that end of the blanket? Thank you for sharing this pattern. It’s such a cute blanket. Beautiful blanket! I have scrolled down a few times from top to bottom to see the finished size posted but can not find. What is the finished size for this baby blanket? Thank you! love this pattern, am making an adult size for a wedding, browns! Thanks! LOVE this pattern!!! Can’t wait to try it in a larger size for a throw for my living room!!!! Thank you for sharing! Love this blanket. Definitely on my to do list for the next friend who has a baby. What a beautiful blanket. I haven’t really made anything for babies, but this looks worth trying. Love the colors and texture of the shell blanket! I’m going to learn the Shell stitch at the Knit and Crochet Show this summer. I can’t wait to use it to make this blanket! Okay, I see that the tch is the chain itself, okay, now pretty sure I finally got it! Yay! I have started this and at the end of row two. Plaease help me here. The tch is the last of the ch3 before the 2dc at the beginning of that row,, sooo. If I have chained three then turned, how can I then still get to that sc? Don’t I need to just sc into the 3 rd doc of the first shell. I know this important to get right because the afghan will not ever come out straight on the sides. I just fI ished a loopy love baby afghan and never got it right, so it is wonky, but they will still love it. This one is for a favorite niece having her little girl next month. A,so, the baby yarn I chose does not say worsted any where, and I chose a variegated and two solids, it is .5 oz. The variegated is a smaller skein and more expensive so I bought two and o e of the others each 463 yards. The mathe makes me dizzy, but I want it to be almost crib size. Not sure if there will, be enough. Planning to trim it in the variegated. Hi Lorinda! I see that you already got the answer to your question. Did you sc in the top of the ch-3 of the previous row? That’s the turning chain (t-ch). Also, with the baby yarn, it’s most likely a category 1 super fine yarn whereas a worsted is a 4, medium weight yarn. If you are using a lighter yarn, you will most likely need more yarn and if you are following the same stitch count, it will turn out smaller. Hi Stacy! Start with your first color, chain, work Row 1, Row 2, and Row 3(repeat of Row 2). Then at the end of Row 3, change to your next color and repeat Row 2 for 3 more rows. Continue working 3 rows of each color, repeating Row 2 for the rest of the pattern. Does that make sense? I am going to attempt to use this pattern and make a prayer shawl for a friend. I love the pattern this stitch makes over the entire project. Needless to say mine will be a “tad” longer (and less wide) If it turns out nice, I’ll take a pic and send it to you. Thanks! I noticed you used a cotton-acrylic blend, but do you think it would still look good using a 100% acrylic yarn? Or do you think it would be too fuzzy, rather than crisp looking? Just wondering if it would be worth the extra money to use the cotton-acrylic blend. Hi Emily! I think depending on what kind of acrylic yarn you use, it should be just fine. I personally like the blend because it’s soft and not fuzzy which is great for babies. However, there are some great acrylic yarns on the market that are not as fuzzy as others. I hope that helps! I have made this patterns many years ago and it is a beautiful, easy pattern. Now I have to make two more as I have to babies coming in early summer! Hi Sarah! If you multiply 6×22, you get 132 then add 1. So to make a larger blanket, for example, you would chain 6×40=240 + 1 which will give you 241. I hope that makes sense! Beautiful design and colors. Thank you. This is definitely my go-to pattern for a baby blanket. It works up quickly and is an easy to remember pattern repeat. The results are always great! I love the simplicity and especially the colors of this one! Gorgeous blanket! Adding to my to-do list! This is my favorite of your free designs. Love the colors, would love to make. I can’t wait to try this one out but I’m nervous because I’m a new crocheter!! This pattern is easy and comes together fast. I use yellow,pink, and blue (5 rows each) and 2 rows of white in between color rows. I did 2 rotations and it finished at a nice size for baby. Can’t wait to give it to mom and baby at her shower. Thanks for the pattern. You’re welcome Cindy! Glad that you enjoyed the pattern! I especially appreciate the fact that there will be an edge as I have a problem with “adding” stitches at the end of a row and my project gets a little off kilter. Made many afghans and have given many away. Even the grandsons wanted them!! When do I change colors. Before I change 3 or after? Hi Joy, I crocheted 3 rows of the same color and switched at the end of the 3rd row. You can switch after the first or second row if you would like but if you want the same look, change colors after the 3rd row. Hi Joy! The multiples and gauge are listed in the pattern. Depending on what size you would like to make, I would chain according to the multiple, and measure with a measuring tape to ensure that you are getting the proper size. I am loving this pattern! I would love to make this as a lap blanket for my mother for this Christmas – around 5′ x 6′. Can you tell me how much Lion skeins I would need for those three color patterns and how many chains should I start with? Thanks so much for the pattern! I’m making this blanket for a friend who is expecting and I’m so excited about it! I’ve crocheted a fair amount but somehow I’ve never changed colours before. I’ve done tons of searching online for ways to change colour and none of them seem to be working. So I’m just wondering what technique you used and if you might have a link for instructions on that technique? Thanks so much! Hi I am working on the trim part of the pattern and had a question about getting started. Can you pick just any stitch to start in? Also after you chain 2 in that said stitch do you start hdc in the next stitch or the same one as the chain? Hi Sheila. You can pick any stitch to start in because you will work around the whole blanket and end up where you began 🙂 Also, I would hdc in the next stitch and join in the chain 2 when you come back around. I hope that helps! I am making this blanket and I think I messed up on the amount of yarn. I bought 6 skeins of Lion Brand Baby Soft 4oz. The pattern didn’t say how many ounces you needed just how many yards. So on the skein it had th amount of yards and I went by that. To get 1860-1862 yards you needed to purchace 6 skeins. My problem is that according to you you crocheted about 69 rows. I am at 71 rows and I have only used 2 1/2 skeins. Can you tell me what I did wrong in figuring how much yarn to use? I also used the same size crochet hook it called for. I have to measure it but I am pretty sure it is over 35*35″. I love this pattern and I used circus print verigated yarn and it is absolutely beautiful! Please let me know what mistake I made so I can figure out how to buy yarn properly next time. This was my first time figuring out the amount and following a pattern. I have always had some one show me how to do a pattern and tell me how much to buy. Hope to hear from you soon. Hi Debbie, you should always check the gauge before buying yarn for a project. Since some people crochet tighter or looser than others, the end result will not always be the same. If you make a gauge swatch, it can help you determine if you are right on track or if you need to go up or down a hook size. Checking your gauge is very important for any project, so that you don’t waste time and yarn. I hope that helps! Thank you very much I will try that next time. Also one other question. How do you do the boarder if you are using a varigated yarn? Can you just continue or do you have to cut off and add on? If you are using variegated yarn, you can just continue with the border. There is no need to fasten off and re-join. Yarn. Well I bought 6 skeins of Lion Brand soft baby yarn and I have only used a little over two skiens. And I can see that the blanket is already bigger than it should be. What did I do wrong? Hi Debbie! What size hook are you using and did you check the gauge before starting the project? Hi – just happened to come across your website when looking online for crochet baby blanket patterns – i already belong to crafty for painting – i love the shell pattern for a baby blanket – do you use regular weight yarn or the baby yarn – i want to use the baby weight as it tends to make a softer blanket and not so heavy – my oldest granddaughter is expecting her first baby in december and i have another granddaughter expecting her first baby in april – the one due in december knows she is having a boy – also want to teach an adopted granddaughter how to crochet – her sister just had a little girl in june so figure its not too late to make a blanket for her – one year when i was still working i made 13 crocheted baby blankets – not only for my daughter but for friends at work – since then have not done any crocheting until now when 2 granddaughters are expecting. Hi Jan! Welcome to my site! For this blanket, I use an aran yarn. If you use baby yarn, since it’s thinner and less bulky, the dimensions will not be the same. Make sure to check the gauge and use the multiples if you need to make it larger. Happy Crocheting! Hi Marcia, unfortunately I do not have the capability to make a video at this time. It sounds to me that you have an understanding of the pattern. I am working up a photo tutorial for a sample of this blanket which will be posted next week. Hi Doris! About what size are you looking for? Hi Amy~ Thank you so very much for this beautiful baby patter. I will start this tomorrow after we return home. This will be such a nice gift for the couple’s new addition… I will be making my blanket in purple & pink from your pattern for this baby… she’s going on 5 months so not exactly a newborn so I hope this pattern will hold her for a while. Also, I would like to know if you have a chevron crib size pattern you would be willing to share. I have a request from someone for this but I can not for the life of me figure sizing out right nor the multiples or pattern…. crazy isn’t it after I just made a king size team blanket & it even recently (July 24th, 2014) took 1st place in our county fair. Amy, thank you so much for this pattern & your time & all efforts into making The Stitchin Mommy a better place for us all. Thank you so much for your amazingly kind words! What size were you thinking exactly? Like 50″x 50″ square or more of a large rectangle? I have a granny ripple and a regular ripple that both be really great. Let me know what you think! I am looking how to make a couple crib blankets in the ripple so I’m thinking more like 30″ x 40″-50″……. I am trying to make this shell right now but have had to rip it out a few times.. this is such a pretty stitch pattern for a baby girl… As I said a moment ago, I have a baby boy to make a crib blanket for too. I saw a Lego pattern somewhere & Thought that would be really cute… what types of patterns do you have for baby boys? So far I know how to do a adult ripple but looking for a baby ripple with increments of 5 & now learning this shell…. I tried a bobble stitch with straight rows but that was a nightmare because the blanket was so uneven.. so I got discouraged & ripped that one all the way out… I would love to send you a picture of this when I get it done if my phone quits malfunctioning through the computer so I can upload pictures from the phone.. I would send it form my Coolpix but that lens is stuck too so that is out of commission for a while. Oh, I almost forgot to ask you; I have noticed that with this shell stitch, there is 1 single piece of yarn that holds the shell on the 1st row together… when at the point of crocheting around blanket, how can I get in there to catch that 1 piece of yarn in each shell to reinforce that piece of yarn? Amy, thank you for your time & help. Hi Kim. So sorry for such a late response. Life gets the better of me sometimes. I don’t have any boy-specific patterns. I really do want to start creating some though. As for the shell blanket, once you add the edging, you can reinforce the shell. I hope that helps! Thank you very much for sharing your pattern. … I’m so excited to make this blanket! My great grandmother made my Mom a blanket using this pattern and I have wanted this pattern since I have taken up crocheting myself! First I want to thank you for sharing this awesome pattern!!!! I started this blanket using the pattern where you alternate rows 2 and 3 and I lost the pattern so I came back to print it and the pattern has channged, Do you by any chance still have the old pattern or have any idea how I can finish my blanket? I have over half of it done and I would really hate to rip it out and start over. Hi Amber! Can you provide me with an email address? I will email you the old instructions. You can either use my contact form or you can email me at thestitchinmommy@gmail.com. I have used the shell stitch in a similar way but all in one color. Now after seeing this one I can not wait to do it in multiple colors! I’m really enjoying making a baby blanket with your pattern 🙂 I have recently started my own blog, and wondered if you would mind if I posted about this project and linked back to your blog. I’m not sure the common procedure for dong so. However, I thought the best idea might be to check with you first. Thanks for sharing your adorable pattern! I just wanted to comment on the beautiful blanket and also let you know that “you” are “beautiful” too! What a beautiful giving person you must be!! This is lovely, thank you for sharing!! Thanks for the pattern! and you colors are beautiful. Just curious if you do anything special for the last row to square it off. I’m almost done with mine but my brain can’t let go of the fact that one edge will be rippled while the rest are straight. Thanks! Hi Salim! I actually just hdc around evenly and it seems to even out the top. I just make sure not to hdc in each stitch at the top. I space them out enough to try to make it look straight. I hope that makes a little sense! PS also, I see you use cottonEase [which I love] but have a Ton of DK weight yarn [anne geddes] and I want to use that…do I double up the strands? Hi KimberlyRae! If you click the green circle with the printer icon at the top of the post, you can print or pdf the pattern. Also, I think it would work if you double up the DK yarn. It should be a sufficient weight to make the blanket to size. 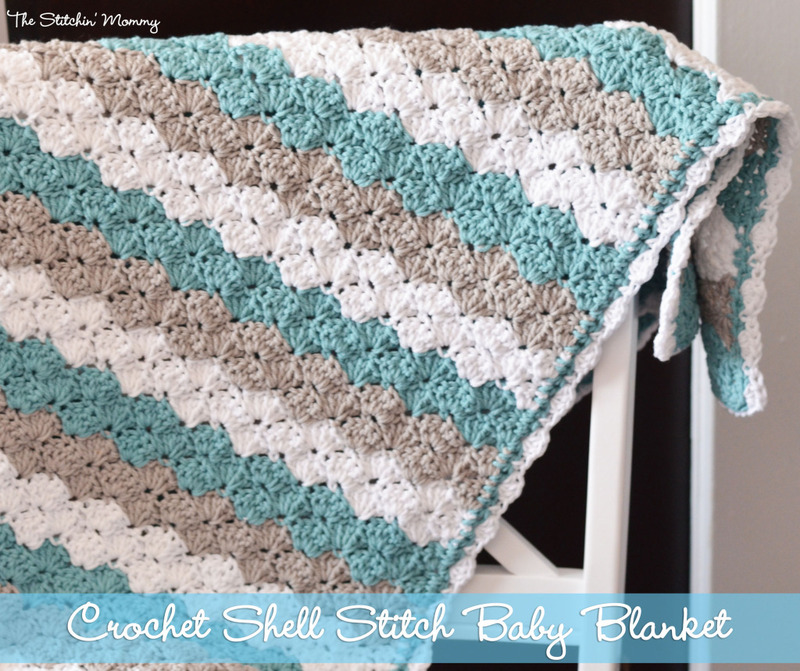 Thank you, Amy, for the Shell Stitch Baby Blanket pattern. I went to the green circle and did the PDF download. On the bottom of the second page where the trim starts ~~ the first row of the trim is written half on the bottom of the second page and half on the top of the third page ~~ makes reading the directions for this row very difficult. I think the pattern is lovely and have placed it on my to-do list. I think I’ll make it a little larger though than a baby’s blanket for the back of my love seat. Again, thanks so much for your efforts in providing a lovely shell blanket for us. Thanks Linda! You can actually click on the text and images to remove whatever you don’t want before saving it or printing it. That might help with the page split issue. Hi! I just bought my yard to start this blanket for my sister in law. She is having a girl. I tried to email you a pic of the colors but the link to your email is broken. How can I tell if I have the updated pattern? I found you through Pinterest. Thank you so much for the pattern – I would never be able to create something like this. Hi Amy. First I just want to thank you for this beautiful blanket pattern. I am making this for a friend due in about 6 weeks. I thinks I started making it with a different pattern version. It had three rows and you had to keep doing row 2 and 3 until end. With that one of my sides keep getting larger somehow, so i ripped it all out and tried again. still not sure I am doing it right. I came back on just to see if there were any comments about this and noticed the pattern has changed. How can I know if this is newest version? I came back in through my Pinterest link? Thank you for your help. This is what is on the page right now. Is this the newest update? Thank you. With first color, Ch 133. Row 1: 2 dc in 4th ch from hook. *Skip 2 chs, 1 sc, sk 2 chs, 5 dc in next ch* Repeat * until you have 3 chs left. Sk 2 chs, sc in last ch. (Now you have an option to change colors or do what I did and crochet 3 rows with the first color before switching to next color). Row 2: Ch 3, turn. 2 dc in the same st. *sk 2 dc, sc in next st, sk 2 dc, 5 dc into sc from previous row* Repeat * until the end of the row. Sc in the turning ch of the previous row. Hi Deboarah. I apologize for all of the changes. I had so many issued with the initial pattern (since it wasn’t properly tested) and have updated it several times. The version that you currently see on the blog is the correct one. You should not have any more issues with it as I have tested it several times to ensure that the pattern you see now is the correct one. If you do however run into anymore issues. Please feel free to contact me and I will help you as best as I can! Also, the link from Pinterest should bring you back to the correct version of the pattern. No problem, thank you for all of your work. I have now done seven rows and it is working out great. Love these colors together. Great! Glad it’s working out. Please let me know if you run into any other issues! Hello. I’m teaching myself crochet and I’m giving this pattern a try. I’m running into an issue at the end of the first row, moving onto the second. I ended the first row with the 5 dc and had three chains remaining. The first step for the second row says to skip 2 dc and sc into the next stitch. Does that mean row 1 should end with 2 dc step instead of the 5dc step? Hope that question makes sense! Hi Renee! I have made a lot of updates to this pattern. Are you looking at the recent version? Since you have 5dc and 3 chs left, you should sk 2 chs and sc in the last ch. Then you can proceed to Row 2. Hope that helps! I’m relatively new to crocheting and had a question regarding fastening off the blanket when I’m finished. I finished my last row. Is there a specific pattern to follow when fastening off before starting the trim? Just love the pattern! I’m done with the blanket and am workin on the trim. I’m confused by what you mean “join trim color in one of the stitches”. Can you elaborate? I’m relatively new at crocheting. Also, do you have pictures of your blanket with the trim? Thank you Susan! I’m sorry if the trim instructions aren’t clear. I did a half double crochet trim around the entire blanket before doing the mini shell edging. 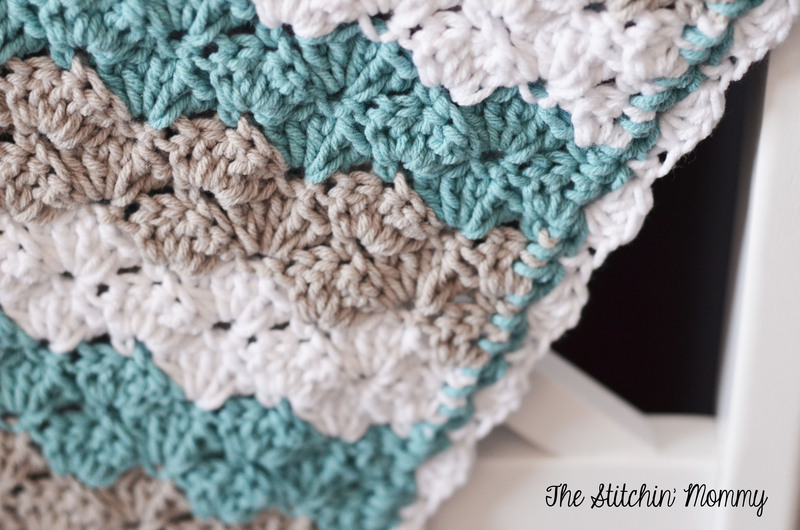 Since you’re just doing a round of hdc’s around the entire blanket, you can join the color with a slip stitch into any stitch and crochet around until you come back to the original stitch. Unfortunately I do not have any other pictures. I gave the blanket away as a gift some time ago. I hope that I was able to help a bit. Please feel free to contact me if you have any other questions! Thank you for posting the actual instruction for the shell baby blanket this was my first crochet project! It turned out beautiful! Also big enough for my queen sized bed. How many ounces is one skein? I’m famous for running out of yarn so just want to be sure I have enough for this project 🙂 thank you! Hi Kerry! Each skein is 3.5oz (or 100g). I’m infamous for running out of yarn mid-project so I know how you feel 🙂 Enjoy! Amy, I have just finished the first 3 rows of your great blanket. I don’t understand after this, you say to “repeat rows 3-4 until the desired length is achieved. But there is no row 4 in your instructions. I don’t really know how to continue. Hope you can help. Thanks in advance. Hi Pat! My apologies. I recently updated the pattern and failed to updated that little sentence. It’s repeat rows 2-3, not 3-4. Sorry! I’ve updated the pattern so that it now reflects that change. Please let me know if you have any other questions! I, too love the colors you chose. Just beautiful! Would love to try this too. Thank you for sharing your talent and your pattern. Which step in the instructions does it replace? Step 2 or step 4? Hi Nevi. It replaces step 3. I have modified the pattern so that it’s a little more clear and makes more sense. I love this blanket! I have a question though. The pattern says multiples of 6+1, so I did a sample row and started with a chain of 25 (4×6+1). I followed your pattern in step 2, but keep ending up with 7 chains at the end instead of 6 like the pattern says. Am I doing something wrong? I just want to be sure I’m getting the pattern correct before chaining 133 and doing a whole first row incorrect. Thanks for your help! Thanks so much for the clarification and the quick response! I’m excited to get started. Amy, A friend of my mother-in-law crocheted a much beloved blanket for each of my children, now ages 36, 35, 32. She passed away before I had an opportunity to ask for the pattern. I have been trying to duplicate the blanket for several years, w/o success. Your pattern is very similar. Thank you, Thank you, Thank you. I found your lovely blanket through Google. I hope you don’t mind me asking a question. I haven’t been crocheting very long and I would like to use this pattern, however I would like to use baby weight yarn (3) is there anything different I would have to do to this pattern to get the same results or just follow the patteren but use the suggested hook size for the yarn I have? Hi Heather! Since baby weight yarn is lighter than worsted weight or aran, your blanket will come out smaller than what the pattern describes. If you follow the pattern as is with the hook suggested for your yarn, your blanket will turn out smaller. To get the desired size, you will have to chain a longer chain. The pattern has the multiples to make a larger blanket. I hope that helps! It is nice too meet you I found you thru http://suzyssitcom.com/ She posted this lovely blanket, and I just had to Pin it and come and get this pattern! I am going to try this, I love the colors you chose! Thanks so much Amy! I can't wait to get started. Cute blanket! I love the stitch and the colors! I absolutely love this~ Beautiful! I do a lot of crochet on my blog too – http://www.nightowlcorner.com. Come visit sometime! Hi Amy! Love this. I just stated teaching myself crochet and was looking for a baby blanketi would be able to make for my son. I'm going to try to attempt this 🙂 Thank you. Hi Amy! I love this patten so much. I just started trying to teach myself crochet and an going to attempt this for my son 🙂 I love it, Thank you. Hi Amy do you know the multiples for the blanket? Want to make it for a toddler so wanna size up a little. Thanks so much! Hi Amy do you know the multiples for the blanket? Wanna make it for a toddler. Thanks so much! The blanket is gorgeous – can I just check, is it 3 skeins of each colour or 3 in total? Sorry to be such an idiot but is it 3 skeins of each color or 3 skeins in total? To make a larger blanket, do I just use even number for the chain? Hi Jennifer! To make a larger blanket, make a longer chain in multiples of 3. To make this blanket larger, will any even number in the chain work. I need to make myself a blanket. And another baby 😉 Ahum. 😀 It even looks soft and cosy! That blanket is so beautiful; I love the colors you chose, and the pattern too. Thanks so much for sharing on Inspire Me Wednesday. Featuring you in next week's issue. Your blanket is so pretty. I had to PIN it. Thanks for sharing the pattern. Have a wonderful day. Just thought you might like an update on the pin. So far it is at 665 repins! That's awesome. And it's still going strong. This is so adorable. Love it! And Pinning! This is a lovely pattern. I think I saw something similar described as the "Breaking Bad" afghan. I love crochet and am currently teaching myself Tunisian crochet. I've pinned this and will make soon. This is my favorite new afghan pattern. I am just finishing one (that I made larger) for a wedding gift for my niece. It is an easy pattern and I love the finished product. Thank you, Amy! Thank you so much Linda! I am so happy you enjoyed the pattern and I hope your niece loves hers!